I think that this may have been the most overlooked car at the Salon; no exaggeration. 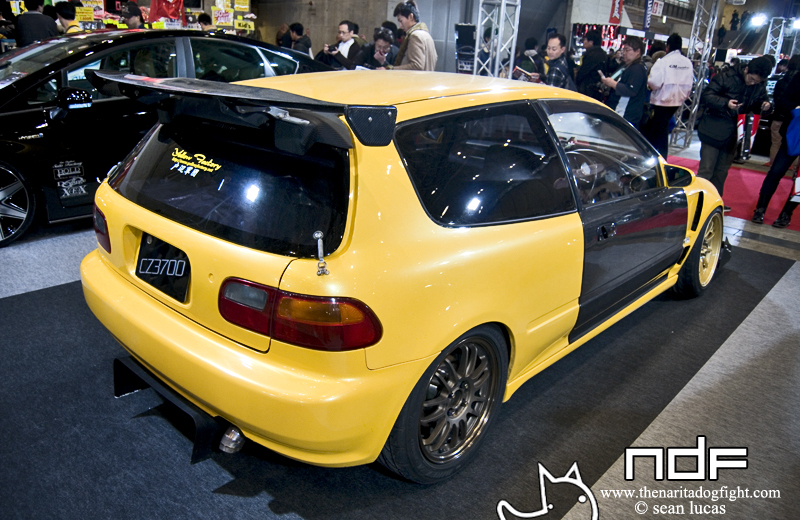 I actually did a double take when I saw this because I couldn’t believe an EG6 was at Auto Salon in the year 2011. 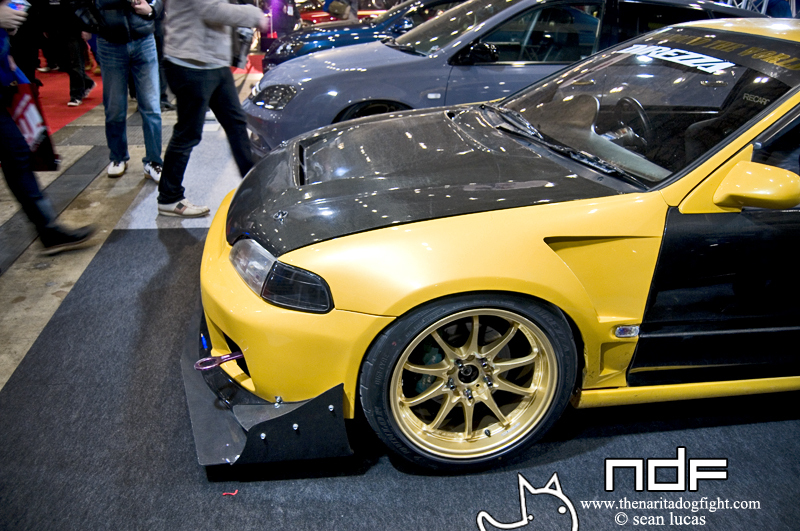 Aside from the actual Honda booth, finding a tuned Honda (other than a CR-Z) at this years Salon was like finding a needle in a haystack; if the hay were made out of Nissans and Toyotas. 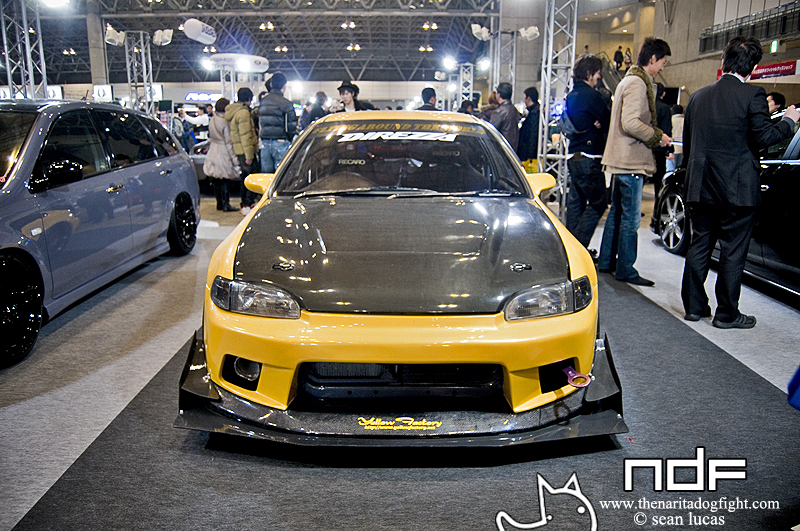 After drifting blew up, the market obviously gravitated toward S-Chassis’ and the like. RWD engulfed Honda’s FWD prior dominance and left them to the devoted few. After I came to my senses I decided that I needed to spend a few moments with this thing. Check out more past the break. Yellow Factory is the garage responsible for this dedicated track machine; actually, I think it is a co-op of YF and cz3700. 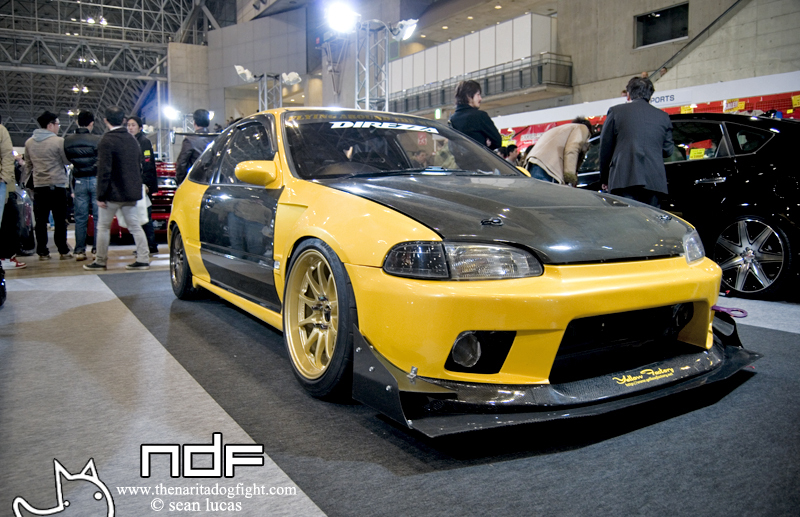 This civic screams of time attack. Giant canards, splitter, carbon components, and GT style wing are all hints about where this car spends most of it’s time; the race track. The coolest thing about this car has probably got to be the unique wheel and tire sizing. FWD cars tend to under-steer, as if you didn’t know that, so having a wider tire or lower offset wheel in the front can often help correct the problem. YF chose to run a 245/40/17 tires up front, and 205/50/16’s in the rear in order to balance the handling of the car. 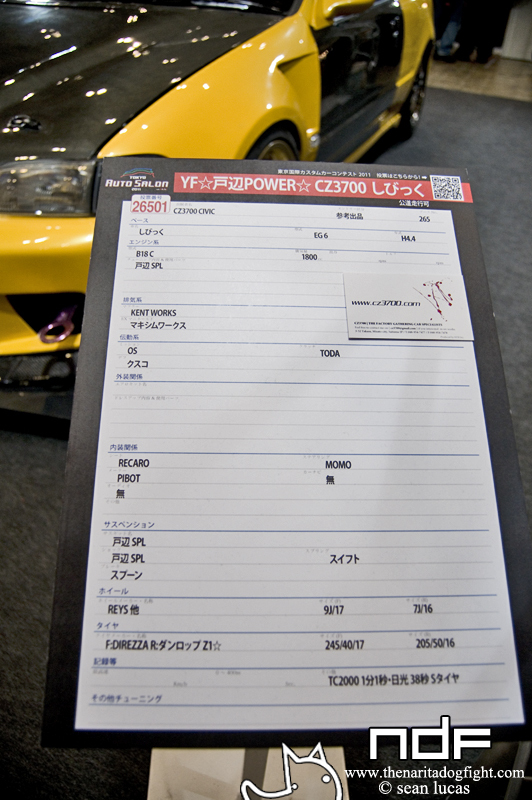 I never got to talk to anyone about the car, but they had a spec sheet out to view. I’ll post a picture of it last. A custom diffuser and exhaust round up the rear end. You can check out a video of the previous version of this car here. Here is a minor spec sheet. The bay is home to a naturally aspirated Toda B18C. At the bottom there you can see that it lapped Tsukuba Circuit in an amazing 1:01.38! I almost couldn’t believe it at first. That’s nearly as fast as a Z-Tune R34. It’s good to see people still choosing to tune Hondas seriously. Gives me inspiration; in fact, I’m going to go wash my civic right now! Enjoy!